Here is the wrap from last year, better late than never. Thanks again to all those who contributed, it has again proved to be quite popular. This entry was posted in Club News, Yearly Review on April 11, 2015 by admin. Crag care is back! The UniSA guys are coming to join us too! Sunday 9th November, 2014. Meet at 9:30am at the car parking near gate #17 on Norton Summit Road. Work will finish at 12pm but bring some lunch and stay for an afternoon climb. This entry was posted in Club News on October 30, 2014 by admin. The CCSA in conjunction with the Friends of Black Hill and Morialta are holding the regular habitat restoration day up in Morialta Conservation Park. Sunday 14th September, 2014. Meet at 9:30am at the car parking near gate #17 on Norton Summit Road. Work will finish at 12pm but bring some lunch and stay for an afternoon climb. This entry was posted in Club News on September 8, 2014 by Events. It’s back! 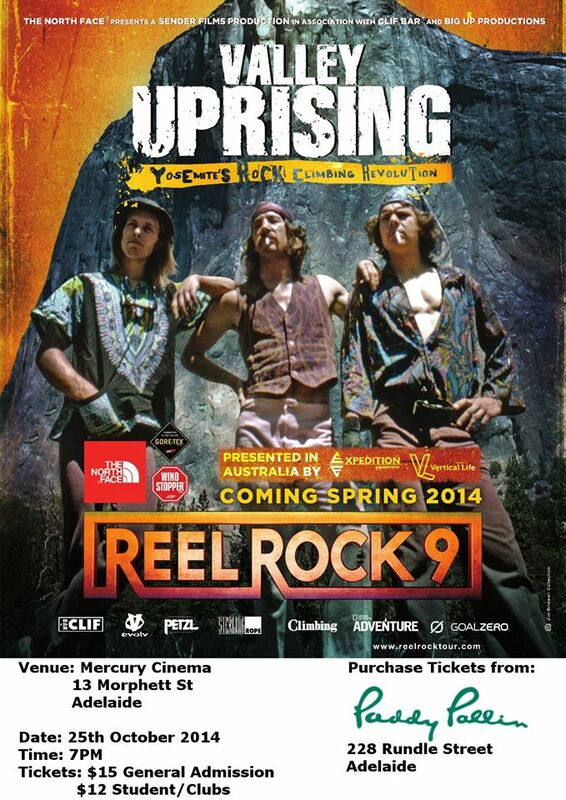 In its ninth year, the REEL ROCK Film Tour features a special presentation of the highly-anticipated feature-length film “Valley Uprising.” The greatest untold story of American counter culture is that of the Yosemite Valley rock climbers. For the past fifty years, Yosemite’s massive cliffs have drawn explorers and madmen to leave materialism behind and venture onto the high, lonesome granite. The larger-than-life characters of Yosemite carved out an “extreme bohemian” lifestyle in the Valley, living on red wine and boiled potatoes, clashing with National Park authorities, and pioneering the boldest climbs on Earth. The torch has been passed down across three generations of climbers; through rivalries, tragedies and triumphs, the art of Yosemite climbing has advanced beyond anyone’s imagination. Valley Uprising is the riveting, unforgettable tale of this bold tradition: half a century of struggle against the laws of gravity — and the laws of the land. Tickets available in store at Paddy Pallin’s now! Discounts apply for Financial members. See the flyer below for more details. This entry was posted in Club News on August 25, 2014 by Events. We received great responses to both the slogan competition and the voting. It was a very close call but there were two stand out winners. First Place with: Climb. Dream. Inspire. Second Place with: Taking South Australian climbers to new heights. We’ll be in contact with the winners by email. Congratulations! This entry was posted in Club News, Competitions on July 18, 2014 by Events. The slogan competition has closed and the entries have been culled down to just the top 5 as selected by the committee. We have tried to choose slogans which support all members, regardless of the way they climb or the reason they climb. It was a tough ask and we had to have more than one round of voting to get to our final 5. Now it is your turn! Please follow the link below and put the 5 slogans in order of preference where the first one is the one you like the most. Voting is open for one week from today till the end of Wednesday 16th July. This entry was posted in Club News, Competitions on July 10, 2014 by Events. The CCSA in conjunction with the Friends of Black Hill and Morialta is pleased to announce our second habitat restoration day up at Morialta Conservation Park. Sunday 13th July 2013. Meet at 9:30am at the car parking near gate #17 on Norton Summit Road. Work will finish at 12pm but bring some lunch and stay for an afternoon climb. This entry was posted in Club News on June 28, 2014 by Events. This entry was posted in Club News on June 23, 2014 by Events. As the CCSA is growing in numbers and activities there is a desire to create a new slogan which the club can then use on banners, the website and anything at all really! At the moment the website just says “A meeting point for climbers in South Australia”. So we’ve decided rather than try and make one up which everyone is stuck with we’ll make a competition out of it and give everyone the chance to be involved. Just send through your slogan to the events email address before Midnight on Monday the 7th of July 2014. You can put in as many entries as you like but duplicate entries of the same slogan will be credited to the first person to email the slogan in. By participating you are giving the CCSA the right to use the slogan you have entered. We’ll collate them and then you will get a chance to vote on the top 5 chosen by the judges. The judges will decide the final winner but your votes will be a significant part of the final judging. First Prize: will be a subscription to the “Climber” magazine. Already subscribe? Don’t sweat it, you can choose a DVD to the value of $30US from ActionSportsVideo. Second Prize: will be a brand new chalk bag for hitting those big walls with. The competition is open to everyone – members and non members, so get writing and good luck! This entry was posted in Club News, Competitions on June 15, 2014 by Events.